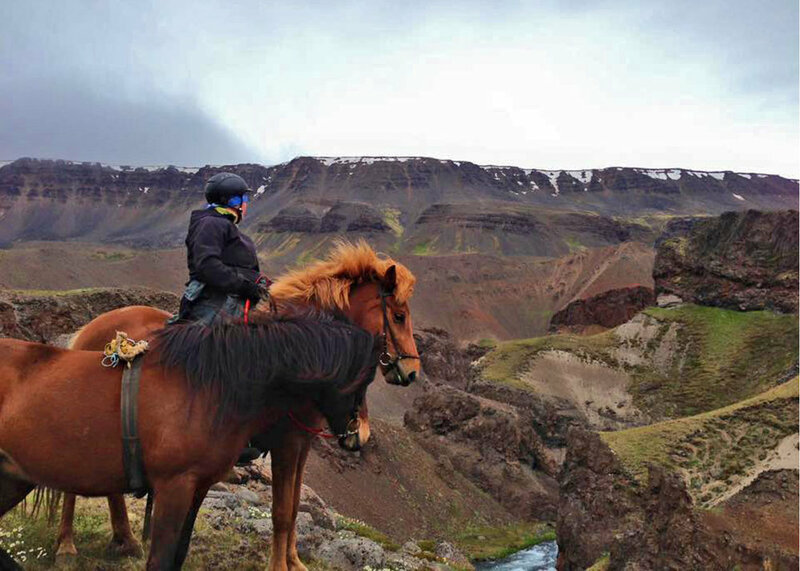 An expedition by horseback across the glacier-carved rivers and valleys of Iceland. $1850 per person, all inclusive of horses, riding gear, expedition leaders, food during the 3.5 day horseback expedition period, transportation to and from Varmahlio, one night of cottage accommodation after horseback expedition ends. Interested in extending your trip before or after this Experience? Bolt members will be arriving and departing on different dates, so you can link up for futher exploration around Iceland. 3.5 days exploring Skagafjörður atop Icelandic Horses. Camp each night under the stars, sharing stories around the fire from the day. Extend your trip to visit other parts of Iceland. Befriend your two horses, switching each day throughout the ride. Soak the day's muscle aches away in one of the many hot springs along the ride. An island carved by glaciers, set high in the Atlantic Ocean. Volcanic activity has shaped Iceland over the millenia, creating a landscape unlike anywhere else on Earth. And then a thousand years ago, in the 9th century, the Vikings arrived, bringing with them a hardy breed of ponies, which developed into the world-famous Icelandic Horse - smaller, rugged animals suited for the environment. Iceland sits atop every "must-visit" travel magazine list, and for good reason. This July, we're going off the beaten path - literally - with an expedition on horseback through one of country's the most beautiful regions: Skagafjörður, the only county in Iceland where horses outnumber people. This trip is designed to accommodate riders from beginner through intermediate, with enough excitement for seasoned riders, too. Upon arrival to the ranch for the start of the ride, each Bolt member will be introduced to their two horses. We'll then spend 3.5 days atop these horses, traversing through a landscape of rivers, glaciers, valleys, and hot springs (!!). By night, we'll camp under the stars, with the horses hitched up and grazing nearby. Day 1: Arrival to Reykjavik in the morning from your flight. Take the day to explore Iceland's largest city, or for the more ambitious and less prone to jet lag, venture further afield to the Golden Circle surrounding Reykjavik. Coming back together for dinner, we'll stay in an Airbnb apartment downtown for an early next-day departure. Leaving Reykjavik at 8:30am, we'll undertake a four hour journey to Varmahlíð (N 65°32,744' W 19°26,338'). From here, we'll meet our horses before saddling up and riding about 3 hours to our first campsite along a river. An early wakeup for the ride over a mountain range, enjoying a beautiful view back down into the valley. Our day ends at a meadow close to the West glacier river (Vestari Jökulsá), where our horses stay overnight and the tents can be put up. Walking down into the gorge, we'll find some hot springs at the river bank of the glacial river. We ride into the valley "Austurdalur“, enjoying the view of the mountains around us. We cross the East Glacier River on a high bridge, and head for the Merkigil gorge, a hidden nature pearl only accessible by foot or horse. At this point, we'll see the full capabilities of the Icelandic Horses. This demanding day ends on the farmland at Kelduland, where the horses get some rest and we'll put up tents for our last night under the stars. Our last day on the horses. Through the river delta of Héraðsvötn we ride homewards. You will be surprised how fast the horses will become once they are on their way home. Returning to the ranch, we'll stay in a comfortable cottage, just a short walk away from the natural hot springs. Refreshed from a full night of sleep, we'll head back to Reykjavik in time for afternoon flights. Or extend your trip in the country to see other parts of the island - you'll have friends to share the journey. 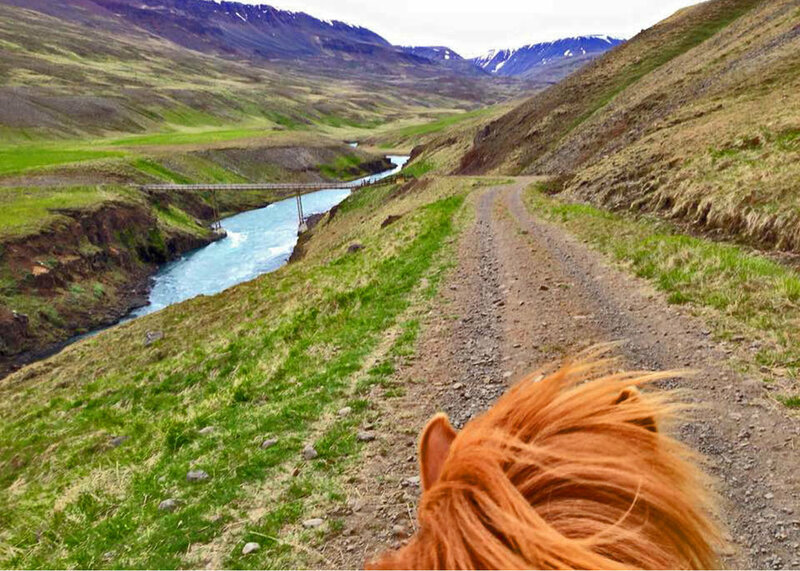 Join us for an exploration by horseback across Iceland.